Dozens of trees planted in honour of fallen soldiers will be replaced because it would be too expensive to save them, a council has said. Campaigners have fought a long battle with Sheffield City Council over the fate of the "living memorial" in Western Road. At a public meeting, it was decided the 41 trees, planted in 1919, would be removed and replanted. 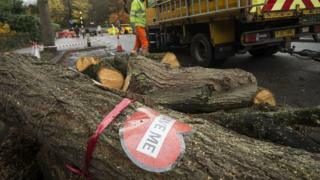 Campaigners said the £500,000 estimate to save the trees was a "joke". Sheffield Tree Action Groups said they were confident a "simple affordable solution" could be found. The trees were planted in honour of local soldiers who died in World War One, but are due to be cut down as part of a £2bn road and footpath improvement project. The council has insisted only trees which were dead, diseased, or causing damage would be felled. At Wednesday's heated meeting, which was adjourned at one point because of shouts from the public gallery, the council said it could fund the removal of the trees from its existing highways contract. But the £500,000 required to save the trees and make surrounding roads and pavements safe would have to be found from other budgets, the authority said. Speaking after the meeting, councillor Bryan Lodge said the council "simply cannot justify" spending £500,000 on the trees. He argued that the council was doing "exactly the same" as it had in the 1940s, when a number of trees planted in 1919 were cut down. "Given that over the years, about half of the original memorial trees have been lost and never replaced, we believe that our commitment to replace the 41 trees, both now and in perpetuity, is a decision that the vast majority of Sheffielders will support," he said. Ms Teal, who was arrested in February during a protest over the trees, said: "Yes, you can put a tree in its place [but] it's going to take 100 years or more to grow to the stature of the current ones. "And of course we'll all know it wasn't the original tree, so the argument from the campaigners point of view is let's nurture and care for these old trees. They could last another 100 years or more." Amey is tasked with maintaining 36,000 roadside trees, including any replacements. as part of its city-wide Streets Ahead contract. The tree removal aspect of the contract has met with much opposition from campaigners.